Spring weather probably means something very different depending on where you live. Even within a 500 mile radius, what’s deemed appropriate for the month of March can vary wildly. That’s why when packing for a trip between February and May, it’s just as important to check the forecast as it is when packing for a winter trip. I’ve already shared by basic packing advice, but I thought I’d revisit the topic in light of spring fashion. Once again, weather and trip purpose are the two biggest factors I take into consideration when assembling a capsule carry-on wardrobe. Update colour, fabric, and trends, and I’m set for another season of wildly un-exotic city-hopping. Despite all the stores advertising flip flops and sun dresses, my reality is that spring is unpredictable and pretty rainy. In French, we have a saying “En avril, ne te découvre pas d’un fil“, meaning, in April, don’t get carried away shedding layers. Precipitation always dictates my footwear and outerwear, and I usually play it safe well into May when it comes to shoes. That being said, as soon as the snow is gone, I bust out my sneakers and brogues, since toe warmth is less of a concern. Outfit one: Sunglasses, Similar bomber, Puma Creepers Outfit two: Scarf, Trench coat , silver brogues Outfit three: Umbrella, raincoat, rainboots (similar). For this example, I’ve chosen three versions of outfits I have in my current wardrobe. I continue to spiral into casual dress since leaving a bank to work in tech (a good thing, I think! ), so I mostly pack flat, sensible shoes. I’m not one for bright colours most of the time, and spring is no different. I’ll wear more creams and light grey, but still a lot of black. On the left, I’ve picked a pretty fun and quirky combo, good for visiting friends, going out to concerts and parties, and walking. In the middle is an outfit I would reserve for a more business-focused trip, where I want to look smarter than I am, and cooler than everyone else (thanks shiny shoes, it’s all you). The third look is definitely practical. I would wear this in the rain, regardless of activity. There’s not much to it, it’s functional, but man do I like staying dry. To go with these outerwear+footwear combos, I’ve put together a few of my favourites for spring, especially for travel. If you’ve been reading my blog, you know I’m over skinny jeans. In fact, everyone is pretty much over it. Two years ago, I was in my summer of the soft pant, which turned into the fall of the straight crop, which has morphed into the spring of the cropped flare. Have I lost you yet? Follow me on Instagram to hear me explain outfits and terms like those in no great detail. Two thoughts behind my choice for dresses here: midi-length is super trendy and helps keep you warm on those days where it’s too cold for dresses but you’re too excited for summer to wear tights. Denim is always a good choice and this wrap dress is really cool. You can also layer it open over some pants. Huzzah! Hit you with the double-purpose packing trick. No real logic with this selection, except that off-the-shoulder tops are still having a moment. I’m a sucker for whimsical prints like the shirts and sweatshirts from local brand Stay Home Club. 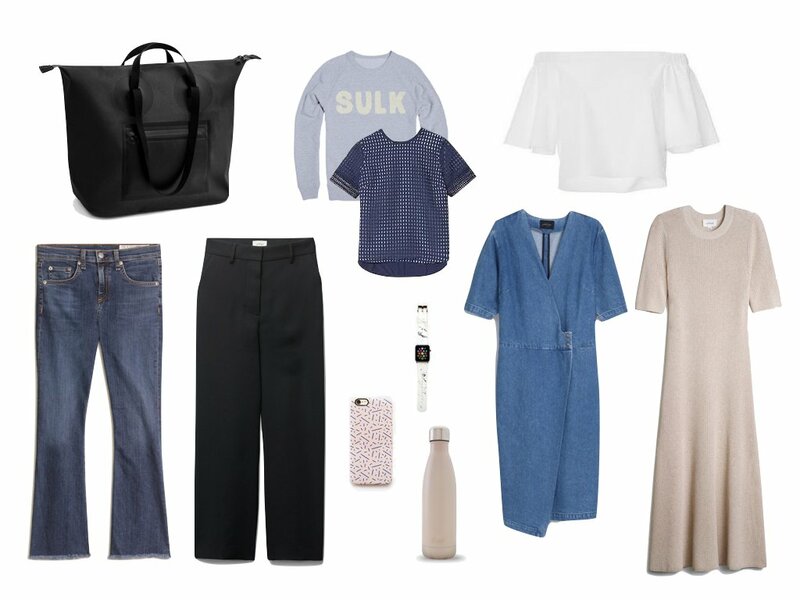 I threw in the eyelet top for good measure, for those times where you want your outfit to communicate: “It’s spring, and I’m trying to be feminine, ignore the loose pants, sneakers, and Carhartt toques”. Not a huge seasonal change here, except for some additional soft pinks and beiges, and this fun graphic Apple Watch strap from Poketo. What I will say is it’s best to over prepare for a cold snap with a hat or light scarf, and to bring your own compact umbrella. Bring extra plastic bags to pack away worn shoes without getting anything else dirty. And that’s it folks! Now that I’ve shared my thought process on how I pack for a spring trip, I’d like to give a shoutout to my mom for finally following my blog this month. Thanks ‘Ma. I had to pack for a flight, the rehearsal and this wedding in Edmonton, for hiking with friends and for Sunday. I was comfortable and warm.